Learning to Master Environmental Change at Work - by Michaeline Skiba, Ed.D. Unexpected parallels: Medical Illustrator vs. Mongolian Monk (Part I of a two-part series) - by Zina Deretsky, M.A. AContinuous-tone copy showing the vertical lines and penciled instructions. BSame as A with the addition of Headliner type (phototype) placed directly on the lines so that the traces will come out of the lettering in the final copy. CFinal print after red lines have been filtered out and all opaquing has been completed. It’s always interesting to read about what we were all doing so many years ago, and browsing through the Journal of the Biological Photographic Association (JBPA) Vol. 46, #3, 1978, was no exception. One of the first things that caught my eye was the Scientific Program for the 1978 Annual Meeting in Seattle, Wash. There were 15 workshops, and abstracts for 31 papers. What was noteworthy about the titles of the papersthey were quite clear and understandable, none involved esoteric introductions. Instead we had “Prints of Radiographs for Publication” or “Photomacrography and the Shroud of Turin,” for example. I recall a presentation of this latter paper by Vernon Miller in particularit was standing room only! These are the types of papers that draw people to attend our annual meetings. Moving on to a paper that proved controversial at the institute where I was working at the time. 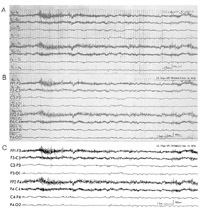 The paper was titled “Quality reproduction of large electroencephalograms” by Judith Webb et al., pp. 133-135. Researchers were horrified to learn that their torn, broken, penciled-in hieroglyphics should be published in such a pristine mannerthey wanted their EEGs to appear in print, warts and all! We eventually arrived at a compromise. My third observation is from Jerome P. O’Neill’s “New Products” section, and I quote: “Photographic equipment is changing so rapidly that it is hard to keep upevidenced by the fact that this column sometimes becomes outdated during the few weeks between writing and printing.” Sound familiar? Mr. O’Neill’s paper “101 ways to make copy and title slides…some of them good” was interesting and inventiveneed I say more? Finally, looking again at “New Products,” it seems to me that traditional photographic equipment has not changed significantly over the past 25 yearsenter digital technology! The creative and photographic minds have exploded, providing us with new, fast, high-quality images unimagined twenty-five years ago. One cannot but wonder what the next twenty five have in store for us!